Please accept our humble obeisances. We, the Members and Devotees of Sri Chaitanya Saraswat Seva Ashram, under the divine guidance of our Sevaite-President-Acharyya, Srila Bhakti Nirmal Acharyya Maharaj, and our Guardian Sripad Bhakti Pavan Janardan Maharaj are humbly inviting your respected selves along with your associates and families for the Special Disappearance Festival of our most beloved Srila Gurudev, Sri Srila Bhakti Sundar Govinda Dev-Goswami who passed away on 27th March 2010. 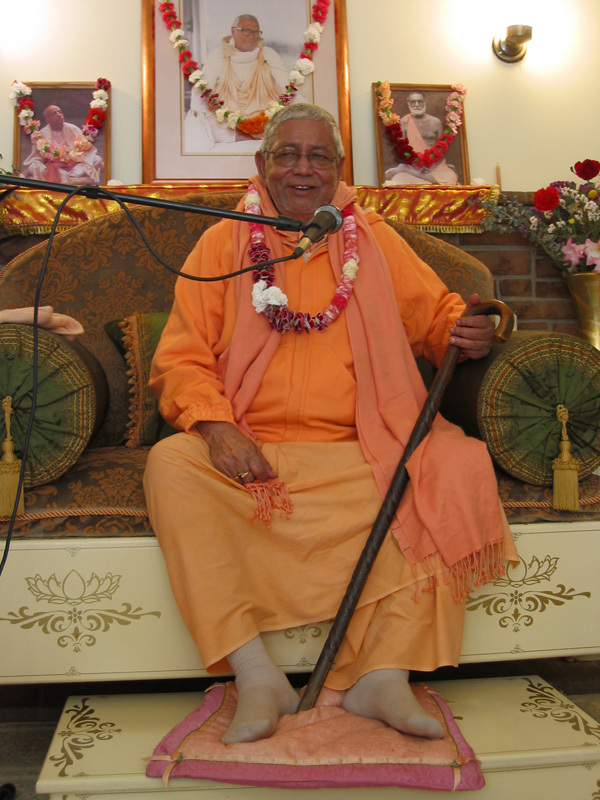 The festival will be held on Tuesday April 6th, starting at 4:30 p.m. at the Sri Chaitanya Saraswat Seva Ashram, 2900 North Rodeo Gulch Road, Soquel CA. On this occasion in our Ashram we shall arrange a grand festival for the special worship, and chanting of Srila Govinda Dev-Goswami Maharaj's divine glories, as well as Kirttan, special worship of the Temple Deities Sri Sri Guru Gauranga Gandharvika Giridharijiu, distribution of opulent Mahaprasadam, and many other devotional activities in the association of honourable Vaishnavas. Any service-donation-checks in the name of "Vaishnava Seva Society" will be accepted for this glorious occasion. In addition, you may also donate directly by credit card via PayPal.